The mere reference to A.P.J Abdul Kalam fills our heart with utmost honor and admiration. He surely was respect personified. Just like the lotus doesn’t get stained by the mud marks despite being blossomed therein, Dr. Kalam managed to grace the canvas of Indian polity with his simplicity and elegance. ‘Wings of Fire’ is portrayed as an autobiographical account of the events of Kalam which evolved him to the person he is (or rather was) today. Avul Pakir Jainulabdeen Abdul Kalam was born to a Tamil family in Rameshwaram. He inherited the humility and simplicity from his parents, who from his early age ensured that all pearls of wisdom for ‘simple living and high thinking’ were imbibed in him right from his childhood. They lived in their ancestral house which was devoid of any luxuries but took care of all necessities of life. He traces his early childhood years when he grew amidst the religion harmony amongst Hindus and Muslims devoid of any religion differentiation. He worshiped Allah in the mosque in the same way as he bowed to Shiva in the temple; his bedside stories included as much tales of Prophet as did the stories from Ramayana. He completed his initial schooling from Rameshwaram and then moved to Ramanathapuram for further studies in school and Trichi for doing his graduation. Post his graduation he got selected in Madras Institute of Technology (MIT). The book is divided into four main sections viz. Orientation (which traces his early years from birth in 1931 to his qualification & appointment at Directorate of Technical Development and Production (DTDP) at the Ministry of Defense in Delhi in 1963), Creation (which traces his formative years from 1963 when he went on a six months training to NASA work centre to his professional evolution layer by layer which earned him the prestigious Padma Bhushan award in 1981), Propitiation (covering his later years in the job from 1981 to 1991 which saw him overcoming the hurdles and challenges in his professional and personal life and becoming the “Missile Man of India” with the development of five missiles – Prithvi, Trishul, Akash, Nag and Agni. This section also has his un-parallel wisdom on leadership and team management) and the last one Contemplation (which traces his outer years from the 1991 till the end of the decade). Who were the people who influenced the early years of the young Kalam? Who helped Kalam to pursue the engineering from MIT despite high fees which he couldn’t afford? Which was Kalam’s dearest dream which he couldn’t realize before he turned to become the Missile Man of India? How did Prof. Vikram Sarabhai shape Kalam’s vision and thinking? Grab a copy of the book to unearth the answers to above and experience the snippets from the life of most loved President of the Republic of India. Despite all the outcries and qualms, India is surely a unique country where even a dirt poor boy from a remote village can become the President, the one which remains the most loved head of the state in recent times. But this book isn’t about his presidential tenor but about a boy from a humble beginning who worked hard to carve out a niche for himself in the rocket dynamics and later making it large in life to become eligible for the most esteemed position of the country. The book takes off brilliantly with the backdrop of Kalam’s village in Rameshwaram providing glimpse of the time and the people shaping his childhood. It’s really interesting to read about the religious harmony and cohesiveness amongst people during those days. Consider this, “The high priest of Rameswaram temple, Pakshi Lakshmana Sastry, was a very close friend of my father’s. One of the most vivid memories of my early childhood is of the two men, each in his traditional attire, discussing spiritual matters.” The anecdotes which Kalam gives to reflect his early childhood days truly forms one of the best part of the book revealing to the readers focal point of all the humility and virtue he possessed. It is rich in motivational texture filled with nuggets of positive thinking citing examples from his own life. There were times when the disappointment and failures bogged down even someone like Kalam exposing him to risk of breaking down and falling back. Just when, he was about to collapse, someone or the other was there by his side to instill confidence and fighting spirit in him which propelled and launched him with greater intensity towards the success. Another great thing which the book does is that it brings forth the contribution of innumerable silent souls who toil night and day to put India on the high pedestal in the map of world powers. These unsung heroes spend a major portion of their lives placing at times the families and relations at the back burner for the achievement of the sole objective of making India independent and comparable of the world’s powerful nations. Kalam, in all humility, pays ode to all those hands which came together for the launch of SLV 3, creation of RCI, Prithvi, Agni etc. While the book has indeed a lot of positives to offer to the reader, at some junctures it become a bit more scientific in representation which might break the flow of a normal reader. I mean while detailing on the professional stint of Kalam, the books transform like a manual on evolution map of India on the nuclear map enriched with scientific terminology and milestone…something which might disconnect the reader from the overall context. Further, some more insights on the personal life of Mr. Kalam and his people would surely have done wonders. The cover page of the book shows Mr. A.P.J Abdul Kalam in a contemplative mood. 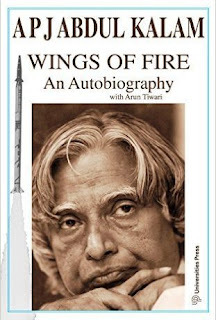 The title of the book ‘Wings of Fire’ perfectly gels with the overall setting of the book which aims to provide inspiration and motivation to the youth to expand and fly high. The printing, font and word spacing are decent enough to grant reader a comfortable read. ‘If you want to leave your footprints on the sands of time, do not drag your feet…’ Wings of Fire do manage to fill your heart with positivity and hope, scoring high on the simplicity and motivational quotient. It is a ‘straight from the heart’ offering from the country’s most loved Head of the State embodying his learning and wisdom from the years and years of hard work, failure and struggle. Multi facets of Mr. Kalam’s personality and ideology will surely increase your respect for him multifold…Respect!!! Read this book for rekindling your dreams and adding fuel to their wings to let them expand and fly in the world of possibilities. 1. I sat alone for a while in silent contemplation. The sand and shells of Rameswaram, the care of Iyadurai Solomon in Ramanathapuram, the guidance of Rev. Father Sequeira in Trichi and Prof. Pandalai in Madras, the encouragement of Dr Mediratta in Bangalore, the hovercraft ride with Prof. Menon, the pre-dawn visit to the Tilpat Range with Prof. Sarabhai, the healing touch of Dr Brahm Prakash on the day of the SLV-3 failure, the national jubilation on the SLV-3 launch, Madam Gandhi's appreciative smile, the post-SLV-3 simmering at VSSC, Dr Ramanna's faith in inviting me to DRDO, the IGMDP, the creation of RCI, Prithvi, Agni...a flood of memories swept over me. Where were all these men now? My father, Prof. Sarabhai, Dr Brahm Prakash? I wished I could meet them and share my joy with them. I felt the paternal forces of heaven and the maternal and cosmic forces of nature embrace me as parents would hug their long-lost child. I scribbled in my diary: Away! fond thoughts, and vex my soul no more! Work claimed my wakeful nights, my busy days Albeit brought memories of Rameswaram shore Yet haunt my dreaming gaze! 2. The trouble is that we often merely analyse life instead of dealing with it. People dissect their failures for causes and effects, but seldom deal with them and gain experience to master them and thereby avoid their recurrence. This is my belief: that through difficulties and problems God gives us the opportunity to grow. So when your hopes and dreams and goals are dashed, search among the wreckage, you may find a golden opportunity hidden in the ruins. 3. My father had always reminded me of the legendary Abou Ben Adhem who, waking one night from a deep dream of peace, saw an angel writing in a book of gold the names of those who love the Lord. Abou asked the Angel if his own name was on the list. The Angel replied in the negative. Disappointed but still cheerful, Abou said, "Write my name down as one that loves his fellowmen". The angel wrote, and vanished. The next night, it came again with a great wakening light, and showed the names of those whom the love of God had blessed. And Abou's name was the first on the list. 4. Stage I performed to perfection. There was a smooth transition from this stage to the second stage. We were spellbound to see our hopes flying in the form of the SLV-3. Suddenly, the spell was broken. The second stage went out of control. The flight was terminated after 317 seconds and the vehicle's remains, including my favourite fourth stage with the payload splashed into the sea, 560 km off Sriharikota. The incident caused us profound disappointment. I felt a strange mix of anger and frustration. Suddenly, I felt my legs become so stiff that they ached. The problem was not with my body; some-thing was happening in my mind. The premature death of my hovercraft Nandi, the abandoning of the RATO, the abortion of the SLV-Diamont fourth stage—all came alive in a flash, like a long-buried Phoenix rising from its ashes. 5. What makes life in Indian organizations difficult is the widespread prevalence of this very contemptuous pride. It stops us from listening to our juniors, subordinates and people down the line. You cannot expect a person to deliver results if you humiliate him, nor can you expect him to be creative if you abuse him or despise him. The line between firmness and harshness, between strong leadership and bullying, between discipline and vindictiveness is very fine, but it has to be drawn. Unfortunately, the only line prominently drawn in our country today is between the 'heroes' and the 'zeros'. On one side are a few hundred 'heroes' keeping nine hundred and fifty million people down on the other side. This situation has to be changed. APJ Abdul Kalam is one of India’s most distinguished scientists. He served as the 11th President of India, between 2002 and 2007. He was fondly referred to as “The People’s President” during his term. He has honorary doctorates from over thirty universities and is the recipient of the country’s three highest civilian awards – the Padma Bhushan, the Padma Vibhushan and the Bharat Ratna.